How Can Music Therapy Keep Seniors Happy and Healthy? In-home care Harrisburg seniors benefit from can include many different approaches to boosting health, including creative alternatives such as music therapy. Some professionals suggest music can have a powerful impact on a senior’s overall health and mood. If you are looking for new ways to make your elderly loved one’s life happier and healthier, here are a few benefits music therapy has to offer. Scientists from the University of Kansas Medical Center found seniors who listened to music or had some type of music therapy displayed mental sharpness and received high scores on brain function tests. Because listening to a range of music is considered an exercise for the brain, your loved one can expect the benefits of a more alert mind and enhanced memory. Listening to familiar music can help a senior reminiscence and focus on memory, which means music therapy may be especially useful when providing dementia care for Harrisburg seniors. When your loved one listens to music, it can make him or her feel a range of emotions. If the music your loved one listens to is uplifting, it may impact him or her in a positive way that causes the brain to release dopamine, which is a chemical that makes a person feel good. Listening to music can offer your loved one the same joy a person experiences from an intimate relationship or eating chocolate. Though music therapy cannot cure, treat, or prevent diseases, it can help boost the mood of a senior who has a serious health condition. Researchers from Drexel University found seniors with cancer who either worked with a music therapist or simply listened to music had healthier blood pressure readings, experienced less anxiety, and were in better overall spirits. Anxiety and stress can negatively impact a senior’s sleep pattern, but music has the ability to soothe these problems. When your loved one listens to music at bedtime, it can enhance his or her sleep patterns and offer a more restful sleep. 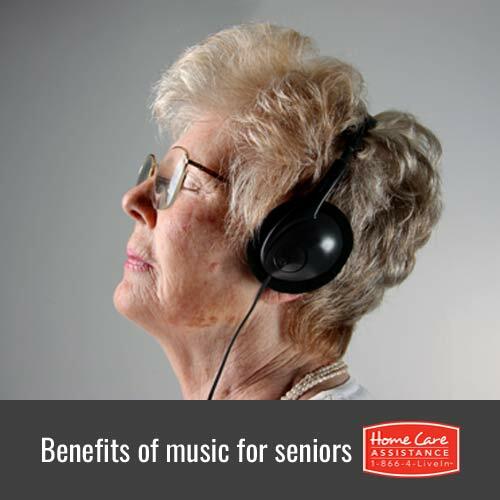 Music has also been known to effectively treat seniors who are experiencing mild insomnia. Listening to music is just one way your loved one can stay healthy and happy. He or she may also benefit from the emotional support and mental stimulation a professional caregiver can offer. At Home Care Assistance, all of our caregivers are trained in the Balanced Care Method, an evidence-based program that promotes excellent physical health, mental awareness, and inner calm. We also offer Alzheimer’s, Parkinson’s, and stroke care in Harrisburg for seniors who need more comprehensive care. For more information, please call one of our friendly Care Managers at (717) 540-4663 to schedule a no-obligation consultation.